An office suite expert explains why the AutoText and AutoFormat shortcuts in OpenOffice minimize repetition and maximize efficiency as well as how to use them. If you try to find some zingy Mark Twain or Dorothy Parker quote to open an article on shortcuts in OpenOffice.org, you'll find that there's just not much there. Few people of wit have chosen to opine on shortcuts. Those who have done so tend to think shortcuts are the path straight to hell. I, on the other hand, think they're grrrreat! At least, the OpenOffice.org shortcut features are. I'll go over two of my favorites in this article. Here's what a shortcut is and why you'd need it. Let's say that you type something like this about 42 times every day. You might type something smaller too, like your name or employer, "The Association of Organizations for Less Red Tape." It's shorter, but there's still some serious repetition going on. Now, you might enjoy typing in general, or you might have memorized and really enjoy typing that particular phrase. But sooner or later, you'll get tired of it, forget it, misspell it or find yourself in an operating room wearing one of those little paper gowns, being prepped for carpal tunnel surgery. That's why you want to capture that text, and perhaps the formatting and graphic, so that you can pop it into your document with a couple keystrokes. Use the automatic replacement formatting feature to create a plain text shortcut. Use AutoText to create a block of formatted text and objects. If you've messed around with turning off the automatic formatting, this window will look familiar. The same feature that you rely on to help you spell better is what will help create your shortcut. 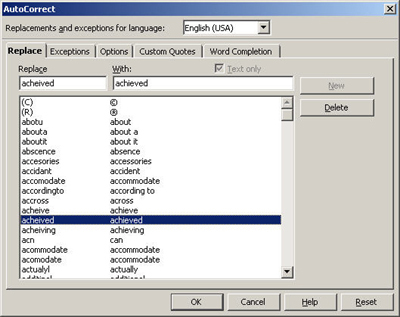 One of the automatic formatting features is the ability to replace, for instance, teh with the, acommodate with accommodate, etc. You can view everything that's getting replaced automatically in your documents by choosing Tools > AutoCorrect and clicking the Replace tab. Everything in that tab is automatically replaced in your document as long as that tab is activated. Now, you'd think the checkbox or button to activate all those options would actually be in that window, wouldn't you? Well, you would, and so would I, but it's actually elsewhere. Click the Options tab and at the top you'll see Use Replacement Table. That means "automatically do whatever's in the Replace tab." 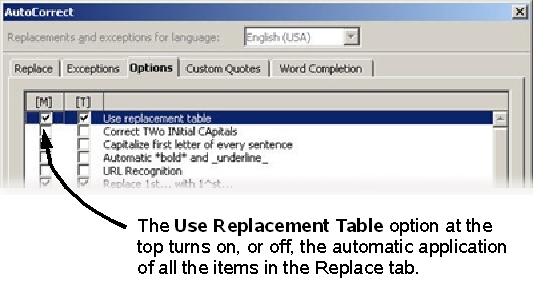 In order to do the replacements in the Replace tab, the Use Replacement Table option in the Options tab needs to be marked. How do you use these items to your advantage? First, you probably want to look through the items in the Replace tab and see if any of them have been driving you crazy. If you find one, select it, and then just click Delete. Now it's time to actually make your shortcut. It's pretty simple. 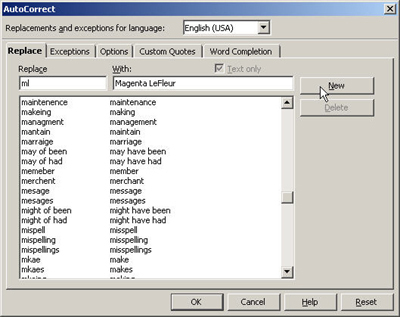 In the With field, type the phrase you want to appear; in this case, Magenta LeFleur. Click New, and click OK.
To make the shortcut appear, just type the abbreviation followed by a space. Hey, where is that shortcut stored? Does it work in any document? That shortcut is stored along with your user preferences, so it follows you around from one document to another. But you won't have it if you work on a different computer. To see exactly where the shortcuts and other automatic formatting preferences are stored, choose Tools > Options > OpenOffice.org > Paths and select the AutoCorrect item. Click Edit, and you'll see all the paths where the information is stored. At the beginning of the article, I mentioned that you might repeatedly type a phrase like this, and insert the corresponding graphic. You couldn't make a shortcut in the AutoCorrect window for this. It's got formatting and a graphic, which is too much for that feature. That's why the AutoText feature was created: for more text, for more formatting and for graphics if you want. You can even put tables into AutoTexts. AutoText lets you select a paragraph, a page or multiple pages that have objects like graphics, tables, sections, frames and others, and then save the item to preserve it as is. You can then re-insert that preserved chunk anywhere you want. And, as with the shortcuts, AutoTexts follow you around everywhere on your computer, so you can insert them into any document you create. First, select the text you want to preserve. Be sure to select the final carriage return so as to preserve the formatting and ensure you've got the graphic. Choose View > Nonprinting Characters to show carriage return symbols. Make sure that, when selected, your text looks something like this. It should not look like this, with the last carriage return unselected. Now, choose Edit > AutoText. Select the category you want to put the AutoText in, and type the name. You can accept the abbreviation that automatically appears in the Shortcut field, or type one of your own. Click and hold down on the AutoText button and choose New. If you want to see it, expand the category you added the AutoText to, select it and choose Preview. It might not show up exactly as in the document, simply because of the display window, but it will be fine when you add it to a document. Now that you've got some text preserved and ready to be effortlessly inserted in any document, here's how to do it. Remember that shortcut that automatically appeared when you created the AutoText? If you don't, that's OK; choose Edit > AutoText, select the item, and check it out. For the example I used, it's OS. Close the window again. Armed with the memory of the shortcut, type it, and then press F3. Bam! The AutoText appears and the shortcut you typed disappears. If you're not wild about using your memory, you can instead choose Edit > AutoText, select the item, and click Insert. Take a few minutes to think about what you type every day or every week. Think about graphics and tables you create that are the same or similar across documents. Think about what text and objects you've got in templates. And of course now think about what you could preserve in AutoTexts. Once you get everything set up, you might never type again. And don't believe people who tell you that there's no such thing as a good shortcut.